I'm interrupting the NARS Spring coverage (I have one item left to show) because I couldn't resist waiting another day to show you my current manicure. 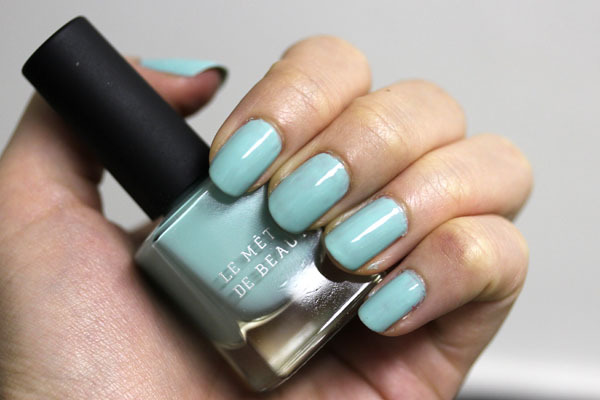 How ridiculously pretty (and trend appropriate) is Le Métier de Beauté Mint Bliss? I mean, even my horrible application cannot detract from that happy hue. I used a base coat, two coats of color, and top coat in the pictures above. In retrospect, I should have done three to even it out. I've spoken at length about the LMdB nail polish formula and you can read about it here. Mint Bliss is even more of a pleasure to apply, if you can believe it. Le Métier de Beauté Mint Bliss is $18 and is exclusive to the John Barrett Salon in New York City. For those who do not have access to the salon, you can also purchase them from johnbarrettstore.com. Is that bottle bigger than the usual LMdB, or do you have teeny tiny hands? Very pretty colour. This look very sweet on you! You have beautiful hands (and I can't wait to see your last NARS spring item)! I love this colour!! Lovely! It looks really sweet!!! It reminds me a bit of a China Glaze hue named "For Audrey". Unfortunately I'm a bit far away from NYC, so I guess I will have to just enjoy my new NARS nail polish. By the way, your post on Gaiety blush helped me deciding to get it. Beautiful on you! I'll have to remember to check out the range the next time I'm in the US.